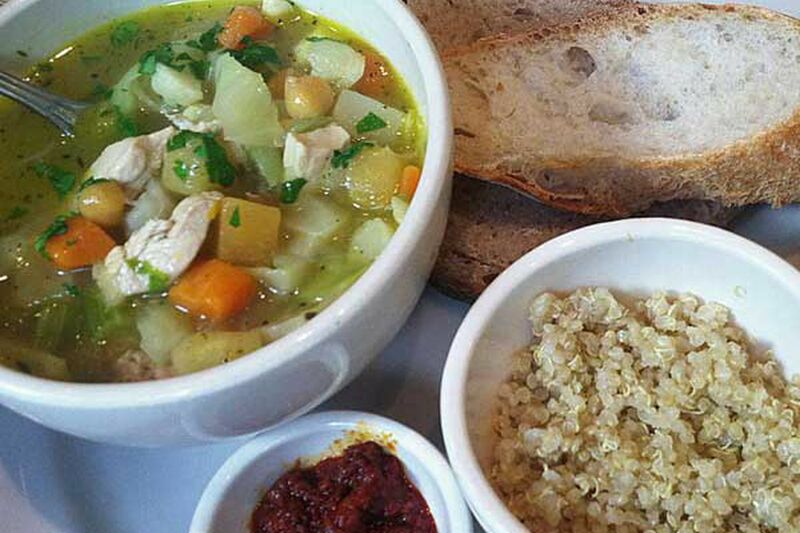 Organic chicken pot-au-feu with quinoa and harissa at Le Pain Quotidien. The soup days are upon us, and few bowls satisfy the craving quite like hearty chicken soup. Le Pain Quotidien delivers an appealing update to the ancient French standard called pot-au-feu, a wintery one-pot stew of root veggies, broth, and meat. True to the Belgian bread chain's sleek organic aesthetic, this rendition is neat and tidy rather than rustic. But I still love all the veggies that fill this bowl, from turnips and leeks to garbanzo beans, carrots, and cauliflower, alongside the tender chunks of chicken seasoned with herbes de Provence. Nice bonus touches are the sides of Tunisian harissa (for extra earthy spice) and a small bowl of quinoa to add some grainy texture. I often find LPQ falls a little short on value for its modest portions, but this dish is a soulful exception. With some slices of its excellent baguette (now baked in Philly), this seasonal special delivers the essence of soup-as-lunch satisfaction.